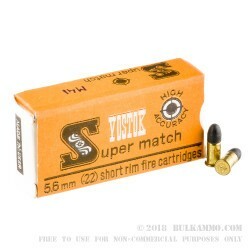 These vintage .22 Short rounds from Vostok are heralded for their flat flight path and high degree of accuracy! 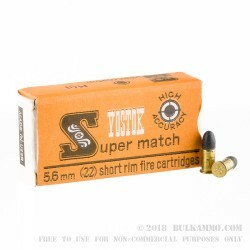 These rounds were manufactured in the USSR in the 1970s, possibly for Olympic use, and will likely never be made again. 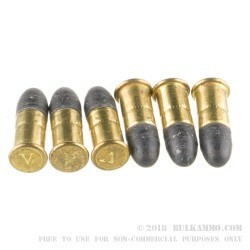 These .22 SR rounds made using non-reloadable brass casings with a non-corrosive rimfire primer mixture. Each cartridge is topped off with a 28-grain lead round nose (LRN) projectile which is quite light for the caliber and offers low recoil and steady ballistics for precise target work. The LRN bullet bears a wide ogive which offers great rifling contact for improved stability. In addition, the bullets are coated with a waxy film which reduces barrel fouling in order to tighten groups after repeat firing. While we cannot guarantee that this ammunition has been kept in any particular storage conditions for the past four decades, our supplier has informed us that there will be no water damage or undue corrosion.